↑ "How is WWF run?". สืบค้นเมื่อ 21 July 2011. ↑ 4.0 4.1 WWF-INT Annual Review (PDF). World Wide Fund for Nature. 2010. p. 43. สืบค้นเมื่อ 21 July 2011. ↑ "PANDA-ING TO THE SOYA BARONS?". Corporate Watch. 2009-09-30. สืบค้นเมื่อ 2009-12-09. ↑ Fred Pearce (2009-04-02). "Ikea – you can't build a green reputation with a flatpack DIY manual". London: Guardian UK. สืบค้นเมื่อ 2009-12-09. ↑ "Changing the nature of business". World Wide Fund for Nature. สืบค้นเมื่อ 2012-08-19. ↑ "Cambodia Rejects CNN, WWF Reports about Mekong Dolphin". CRIEnglish.com. 2009-06-24. สืบค้นเมื่อ 2013-03-02. ↑ "Cambodia threatens to suspend WWF after dolphin report". สืบค้นเมื่อ 2009-08-16. ↑ "Authors of report on dolphins will not face charges official says". สืบค้นเมื่อ 2009-08-22. ↑ WWF. "Desde nuestros comienzos hasta hoy". สืบค้นเมื่อ 2012-04-15. ↑ WWF. "Cazador blanco, sangre azul". สืบค้นเมื่อ 2012-04-15. 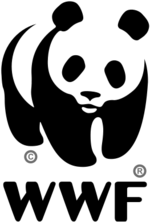 ↑ WWF (2004-03-24). "King's bison shoot stirs anger of conservation groups". The Guardian. London. สืบค้นเมื่อ 2012-04-15. ↑ WWF. "El Rey es opera trap rompers la camera en un via de caza en Botswana". สืบค้นเมื่อ 2012-04-15. ↑ WWF. "La izquierda ve "una falta de respeto" en el viaje del rey a Botsuana". สืบค้นเมื่อ 2012-04-15. ↑ Roberts, Martin (2012-07-21). "King no longer president". London: Telegraph.co.uk. สืบค้นเมื่อ 2012-08-19. ↑ Press Association (2011-09-08). "Prnce Charles - President of UK WWF". London: Guardian. สืบค้นเมื่อ 2012-08-19. ↑ Stephen Bates (2004-11-06). "Charles enjoys hunting". London: Guardian. สืบค้นเมื่อ 2012-08-19. หน้านี้แก้ไขล่าสุดเมื่อวันที่ 7 กันยายน 2561 เวลา 01:17 น.